Sam Brake, farming director at the Biofuels Center of North Carolina, walks through a test plot of Arundo donax. OXFORD, N.C. -- It's fast-growing and drought-tolerant, producing tons of biomass per acre. It thrives even in poor soil and is a self-propagating perennial, so it requires little investment once established. To people in the renewable fuels industry, Arundo donax — also known as "giant reed" — is nothing short of a miracle plant. An Oregon power plant is looking at it as a potential substitute for coal, and North Carolina boosters are salivating over the prospect of an ethanol bio-refinery that would bring millions of dollars in investment and dozens of high-paying jobs to hog country. 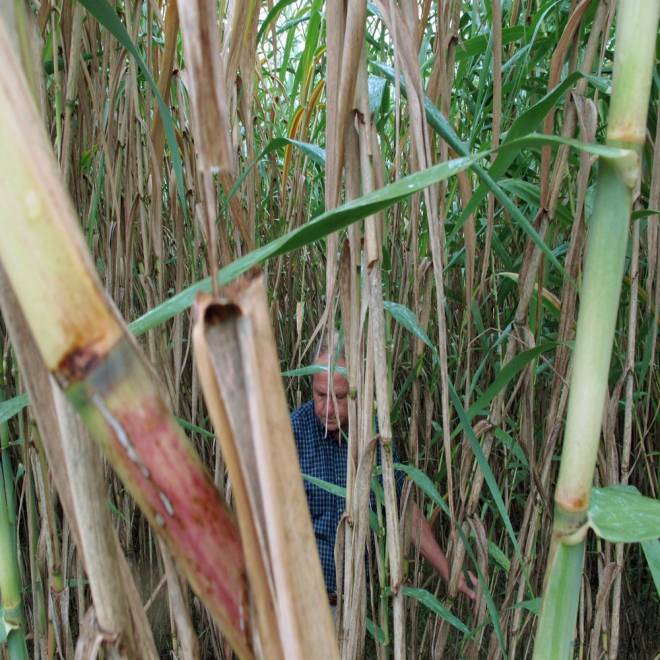 But to many scientists and environmentalists, Arundo looks less like a miracle than a nightmare waiting to happen. Officials in at least three states have banned the bamboo-like grass as a "noxious weed"; California has spent more than $70 million trying to eradicate it. The federal government has labeled it a "high risk" for invasiveness. Many are comparing Arundo, which can reach heights of 30 feet in a single season, to another aggressive Asian transplant — the voracious kudzu vine. More than 200 scientists recently sent a letter to the heads of federal agencies including the Environmental Protection Agency and the Departments of Agriculture and Energy, urging them not to encourage the commercial planting of known invasives like Arundo. "Many of today's most problematic invasive plants — from kudzu to purple loosestrife — were intentionally imported and released into the environment for horticultural, agricultural, conservation, and forestry purposes," they wrote Oct. 22. "It is imperative that we learn from our past mistakes by preventing intentional introduction of energy crops that may create the next invasive species catastrophe particularly when introductions are funded by taxpayer dollars." Mark Conlon, vice president for sector development at the nonprofit Biofuels Center of North Carolina in Oxford, hates the comparison with "the weed that ate the South." "There's no market for kudzu," says Conlon, who is among those promoting a proposed $170 million, 20 million-gallon-a-year ethanol project here — and Arundo's role in it. "There's no reason to manage it. It was thrown out in the worst places you can think of and left there." Sam Brake shows a "rhizome" from an Arundo donax plant in a test plot near the Biofuels Center of North Carolina in Oxford, N.C.
His message about Arundo: It'll be different this time. We can control it. But Mark Newhouser, who has spent nearly 20 years hacking this "nasty plant" from California's riverbanks and wetlands, has his doubts. "Why take a chance?" he asks. The back wall of the North Carolina biofuels center's lobby is dominated by a large timeline, beginning with the General Assembly's 2006 recognition of the state's potential as a biofuels leader. The display ends with a panel declaring "10% in 10 Years" — meaning that by 2017, a decade after the center's creation, officials hope companies here will be producing the equivalent of a tenth of the liquid transportation fuels consumed in the state annually, or 600 million gallons of renewable biofuel a year. "An extraordinarily audacious goal," W. Steven Burke, the center's president and CEO, says proudly. Near the middle of the timeline is this: "November 2011: 50-acre energy grass propagation nursery established with Arundo donax." The center's staff has explored a variety of biofuel raw materials, from food crops like corn, sugar beets and industrial sweet potatoes, to cottonwood and loblolly pine trees. Even pond scum — or duckweed. All were either hard to raise in quantity, too expensive or more valuable for other uses. The staff also studied so-called "energy grasses" — giant Miscanthus, coastal Bermudagrass, switchgrass. Out behind the center, farming director Sam Brake planted test plots of four varieties of sorghum. But for hardiness, ease of cultivation and maintenance, and, above all, yield per acre, none comes even close to Arundo donax. "Wow! Exclamation point," says Burke, who, in his matching gray suit and shirt and with his snow-white hair and beard, evokes the evangelical preacher. Believed to have sprung from the Indian subcontinent, Arundo has spread around the globe. Europeans have been using it for centuries in the production of reeds for woodwind instruments. Like kudzu, which came to the United States as part of Japan's exhibit at the 1876 Centennial Exposition in Philadelphia, Arundo arrived here in the mid- to late 19th century. And also like kudzu, Arundo was once touted as a perfect crop to help stem erosion. In California and Texas, farmers, ranchers and government workers enthusiastically planted it along waterways and drainage ditches. Shallow rooted, the canes would break off and move downstream, starting new stands. Arundo has become "naturalized" in 25 warmer-weather states, according to a USDA weed risk analysis released in June. In banning it, California, Nevada and Texas have said the plant crowds out native species and consumes precious water. The Tennessee Exotic Pest Plant Council lists it as a "Significant Threat." Virginia officials have labeled it "moderately invasive." The West Virginia Division of Natural Resources has categorized giant reed as "occasionally invasive." But that might change if it were to be promoted as a commercial crop, says Elizabeth Byers, a vegetation ecologist with the agency's wildlife diversity unit. "I certainly wouldn't want to see any invasive species used as biomass," she says. "Because they can escape." 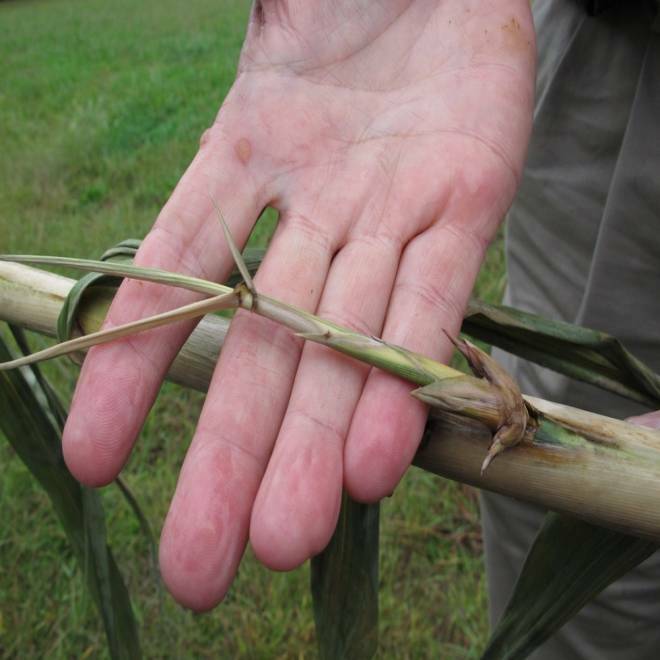 North Carolina is keeping an eye on Arundo, but the folks in Oxford say past need not be prologue. Earlier this fall, Chemtex International christened the world's first commercial-scale cellulosic ethanol plant in the northwest Italian city of Crescentino. Turning inedible biomass into sugars, the company hopes to produce up to 20 million gallons of fuel a year. By mid-2013, Chemtex wants to break ground on a like-sized plant that would employ 67 people in North Carolina. It has set its sights on the little city of Clinton, in the heart of hog country. David Crouse, a soil scientist at North Carolina State University, says energy grass production and the Tar Heel State are "a logical match" — depending on which grass it is. Spread across the state's coastal plain are about 100,000 acres of so-called sprayfields, onto which industrial farming operations pump millions of gallons of hog and chicken waste per year. In order to comply with federal clean water regulations for runoff of nutrients such as nitrogen, many of those fields are already planted with energy grasses, chiefly coastal Bermudagrass. In terms of yield, Arundo far outpaces the competition — up to 20 dry tons per acre, versus 3 to 6 tons for Bermuda. So planting Arundo would require far less land to supply Chemtex's fiber needs. The problem is, the fields' owners also need to worry about absorbing the nitrogen in the manure and the jury is still out as to whether Arundo would be a good fit. "If it's not, it's not where we need to be on the swine farms," Crouse says. Brake and his colleagues in Oxford are trying to figure that out. On a farm a few miles from the biofuels center, a dense patch of what look like anorexic palm trees waves in the light autumn breeze. They tower over the 6-foot-2 farming director. Brake planted this quarter-acre plot of Arundo donax in 2010. He's been applying fertilizer at four different rates — zero to 120 pounds per acre — to gauge the plants' nutritional needs, as well as their ability to absorb nitrogen. Even in the tightly packed, red-clay soil, they have thrived. Brake steps into the thicket and struggles to wrap his arms around a clump. "It's about maybe 3 foot in diameter," he says. So far, yields from North Carolina test plots have averaged from 5.8 dry tons per acre at the Oxford site to just over 11 tons in the sandy loam soils in which most Chemtex suppliers would be planting, though NCSU soil scientist Ron Gehl notes these are not yet "mature stands." Brake grabs an Arundo stalk and walks until it's parallel with the ground. Tiny seeds cascade to the ground, clinging to a visitor's wet shoes. "You afraid of becoming Johnny donax-seed?" he asks with a chuckle. The seeds are sterile, he says reassuringly. Brake points to a joint on the stalk where a small sprout or "node" peeks out. "Each node is a potential plant," he explains. "That makes it easy to propagate." And that's what gives so many pause. In the 16 years since Arundo was first identified in California's Sonoma Creek Watershed, Mark Newhouser has developed an attack strategy. First, workers spray the mature cane with herbicide, then move in with the large flail mowers. If that doesn't do the trick, it's time for chain saws. "And then you'd still have all of these stumps of cane sticking up everywhere," he says. "You can't even walk through there." The cost: Up to $25,000 per acre. To address such concerns in North Carolina, state agriculture officials teamed up with the biofuels center last year to craft a set of "best management practices" for energy crops. Among them are not planting directly adjacent to streams and irrigation canals, and establishing buffer zones of at least 20 feet around production fields. They are listed as "voluntary." But anyone wishing to do business with Chemtex would have to sign a contract agreeing to certain ground rules, says executive vice president Paolo Carollo. He points out that a $99 million USDA loan guarantee announced this spring also came with certain mitigation measures. Noting that Chemtex has already made conditional agreements to plant 10,000 acres near Clinton, Carollo points to a factory near Venice, Italy, that, from 1937 to 1962, used Arundo grown on 12,000 nearby acres in the production of fabric, including Rayon. "And they never had issues of spread," he said in a phone interview from the company's headquarters in the coastal city of Wilmington. When production ceased, he said, those acres were converted back to pasture land. Attempts to commercialize Arundo donax in other parts of the U.S. have met with limited success. When a company proposed to use Arundo for power generation in Florida, the state Department of Agriculture and Consumer Services drafted regulations requiring permits for plots larger than 2 acres. Although some permits have been issued, the large-scale project that prompted the regulations never materialized. And when Portland General Electric decided to convert a power plant from coal to biomass, Oregon state agriculture officials conducted a risk assessment for Arundo. Last year, the state authorized a 400-acre "control area," prohibiting plantings within a mile of water bodies and requiring growers to post a $1 million eradication bond. In a statement released last March, the Native Plant Society of Oregon accused the state of understating the risks. It cited research suggesting that Arundo's sterile seeds might, through "genetic modification," become fertile. When Chemtex announced its plans for North Carolina, the Environmental Defense Fund and others petitioned the state to have Arundo declared a noxious weed, and to ban it. Officials expect to make a decision by early next year. Federal action could take longer. In January, the EPA gave Arundo preliminary approval under the federal renewable fuel standard program — meaning producers could qualify for valuable carbon credits. When environmental groups complained that the decision was at odds with an executive order aimed at preventing the spread of invasive species, the agency agreed to re-evaluate the crop. Without the EPA's renewable fuels designation, Arundo would be less profitable to grow. And without Arundo in the mix, says Conlon, "I would be greatly concerned" about the Chemtex project — and the state's grand plans. "North Carolina's on the precipice of becoming an economic powerhouse around this whole idea of advanced biofuels," Conlon says. "There's room down there to build five or six of these facilities, if and when we can figure out the right balance between environmental concerns and economic viability." Burke notes that Arundo has been sold in the state for years as an ornamental, without any problem. To him, it's a no-brainer. But EDF Southeast Director Jane Preyer wonders if a hurricane-prone state like North Carolina is the smartest place to grow such a crop on so large a scale. In 1999, Hurricane Floyd caused widespread flooding that put much of eastern North Carolina under several feet of water. Arundo, she says, appears "not worth the risk." It's naive to think man can truly control nature, says Newhouser in California. "You know, that's the thing with weeds. They know no boundaries, and they don't recognize fences. They don't follow rules."